Delhi has a lot of stories to tell. 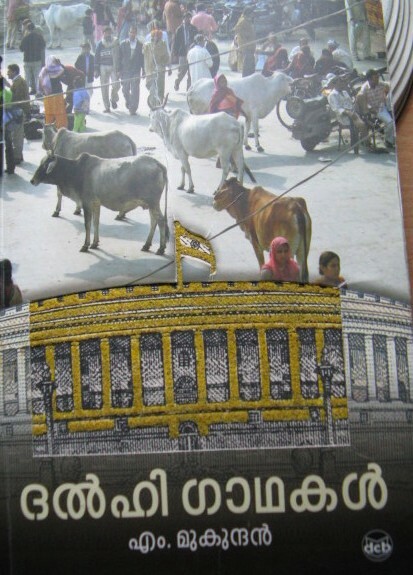 M Mukundan, a Malayalam novelist, has written two novels set in Delhi. His latest novel published a few months ago is Delhi Gathakal (Delhi Ballads). It tells the story of Delhi from 1962 (the Chinese aggression) to more or less the present time. Sreedharanunni dies of a heart attack when China invades India in 1962. The invasion is a kind of betrayal by China, according to Sreedharanunni who is a Communist. If Pakistan had attacked India, Sreedharanunni would not have suffered a heart attack. Sreedharanunni’s wife, Devi, gets a job as a grade four employee in the Parliament where her late husband worked. She struggles to bring up her two children, Satyanathan and Vidya. Eventually Vidya will also vanish without a trace from Devi’s life when a rich Delhi boy falls in love with her. Rahul Sharma’s father does not punish Vidya before warning her. Satyanathan becomes a victim of Sanjay Gandhi’s excesses with vasectomy during the Emergency. He was a student in the University when sterilisation was imposed on him along with numerous others who were driven like cattle into various operation theatres in Delhi. Satyanathan overcomes his initial depression and goes on to become a typical Delhiite who hankers after affluence and the superficial life that goes with affluence. A job with the Economic Times affords him such a life. Most characters in the novel resemble Vidya and Satyanathan in one way or the other. Jaswinder, for example, is the daughter of a poor carpenter, Uttam Singh, who cannot afford to pay any dowry to his daughter. Joginder who marries her out of love belongs to a comparatively rich family. The family will take revenge on Jaswinder later when the anti-Sikh riots break out in Delhi following the assassination of Indira Gandhi. The family will escape leaving Jaswinder locked up in their house which will soon be burnt down by the rioters. Jaswinder vanishes from the face of the earth. Kunhikrishnan is a journalist who disappears during the Emergency. However, he reappears later only to live depending totally on his wife, Lalita, because the police had beaten both his arms dead so that he wouldn’t use them for writing any more. But Lalita becomes his amanuensis. Eventually the couple becomes rich by writing books and then by establishing themselves successfully in the publication industry itself. Rosily is a call girl who got into the profession in order to earn money for her starving family members as well as for earning her dowry. Years later, she is united with her fiancé who waited all through for her. Even after marriage they are condemned to live apart as he works in Dubai. Vasu is a hippy artist. He does not bother about anything. But one Hari Lal Shukla becomes his promoter. Shukla sells Vasu’s paintings which slowly become highly valued. When the hippy is set on fire, mistaken as a Sikh, during the anti-Sikh riots, Hari Lal Shukla watches it from a distance with a secret glee within his heart. After Vasu’s death Shukla becomes the owner of all Vasu’s paintings worth crores of rupees. Sahadevan is the protagonist-narrator of the novel. It was Sahadevan’s ambition to write a novel about Delhi from the time he set foot in Delhi in 1959. He lives his entire life for others, for his family members who are in Kerala, and for other poor people in Delhi. He is there to help anyone in need. His own business, small as it is, is bulldozed by Sanjay Gandhi’s men during the Emergency. But he manages to survive. In the appendix of the novel we meet Sahadevan visiting M Mukundan with a request to publish his novel in Mukundan’s name. Delhi Gathakal is published. Sahadevan’s self-sacrifice is complete. The final twist in the novel is a brilliant ploy used by the novelist. Where does fiction end and fact begin? Can we separate the two, in fact? Is the writer any different from Hari Lal Shukla? Mukundan takes a dig at himself in order to ask the question: Is the writer’s responsibility over with the task of writing? Is it enough to be an economically successful journalist like Satyanathan? Is the writer thriving on the poverty and injustice around him? The novel that runs into 500-odd pages has many more characters and incidents that may perturb a discerning reader with many a question. This entry was posted in Books and tagged delhi, delhi gathakal, m mukundan. Bookmark the permalink. Yes, Deepak, M Mukundan is a highly left-leaning writer with overt Marxist associsations. Sounds like a book I’d love to get my hands on – 500 pages and so many characters is a bit scary but not overly so as it is set against the background of the emergency, the forced vasectomies, the ’62 war w China – everything we lived through without it really touching us in far away Bombay. KayEm, you will love the book (I assume you read Malayalam). The novel has not been translated into English yet. Oops, Matheikal, I don’t. Let me know when there is a translation please.